I could have made my title it's not easy being a bird or human in winter since I lost power for 18 hours but it's still harder being a bird. My furnace is running full blast warming up my freezing house. Oh my, that is a great photo Carver! Sorry you lost your power for 18 hours but you put it in perspective when relating to the birds. I wonder where they go? A roaring fire sounds lovely. I remember as a child we used to have toasting prongs for slices of bread, and we could heat up water for a pot of tea. I still remember the wonderful taste of that toast. A great b&w shot, thats what it is! A beautiful b&w post, well done! True words and a great photo ! 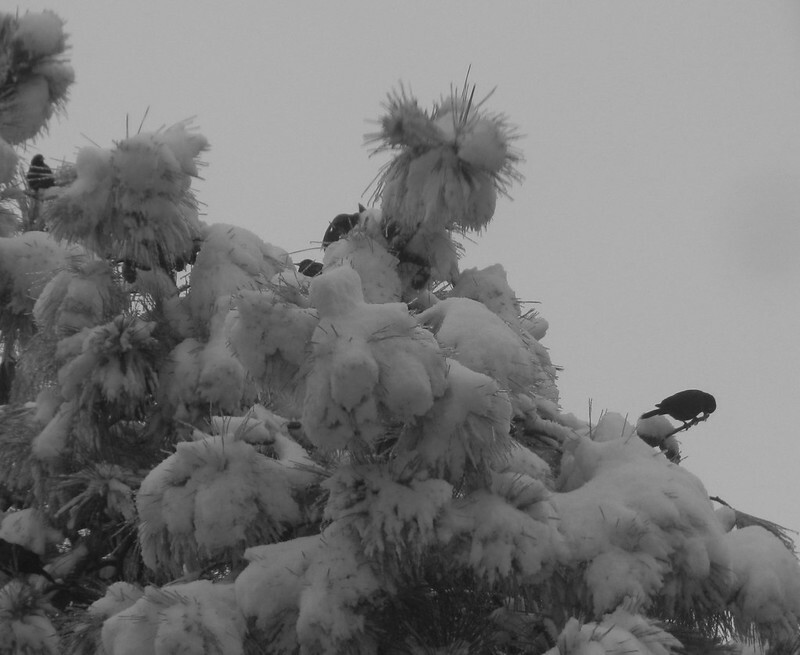 Lots of snow at your place too :) A beautiful winter photo, but not easy for the birds. Glad the power is back. You are still buried in snow? Oh my - 18 hours without power is a very humbling experience. Always feel sorry for these little characters struggling to survive in snowy worlds. But they do. Such huge mounds of snow on the tree in your photo. The birds must have a hard time, but I've never heard one complain about the cold. They always seem happy. glad you have your heat back. :) I always wonder how the birds can copr with the hardship. It is explained. but still. Wonderful winter photo in B&W and so true words! Struggling birds. Nice to know you've got the power back. An excellent winter photo. I'm so glad I'm not a bird. Poor birds, and poor you. Our landlord recently replaced our boiler which meant two days without heat. I don't think I would have lasted 18 days. Great picture. Oh my gosh. I almost commented on the post above (as I'm catching up backwards) that it can't be easy being a people this winter up there. But of course right even worse for the poor birds. Goodness GRACIOUS! What a cold structure. Wonderful wintry BW capture! Brrrrrrr! I'm glad you have your power back. We are used to that happening up here in the north, it is a fairly regular occurrence and so we have a generator. This must have been very frustrating and surprising for you.